Would you like to drink filtered water at an affordable price, without adding more plastic to your kitchen? Then a glass water filter pitcher could be your answer. Tap water is generally not nearly as healthy as many people think and whilst water filter pitchers are becoming more common place in the kitchen, most are made from plastic. This is not everyone’s first choice, be it for environmental concerns, health ones, or both. Whilst we used a Brita water filter pitcher for years, when I had my daughter, I decided to research more plastic free options. 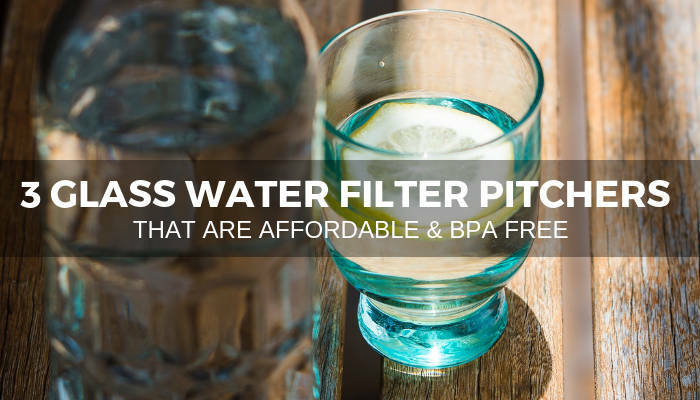 I was surprised at how limited the glass options were, to be honest, but the good news is that there a few glass water filter pitchers out there at an affordable price. Here are 3 of the best glass water filter pitchers I’ve personally come across. Where they also contain some plastic parts (for examples lids), at the time of writing, these were listed on the product details as BPA free. I know, this isn’t technically a ‘pitcher’. But it is a filter. And it’s glass! Also, the advantage of the Kor Water Fall is that it comes with 2 glass carafes, so you’re not constrained to just one carafe of water at a time. This means you can filter water into as many carafes as you want (although you’ll have to buy additional ones if you want more than 2). A Kor Water Fall Set comes with a Water Fall stand, 1 filter & 2 glass carafes, both with lids. Plastic components are listed as BPA free. If you’ve got a designer’s eye for kitchen ware, the KOR could be a good choice – it will filter out basic contaminants, plus it will look rather stylish on your worktop too! certified to NSF 42 standard to remove chlorine, chloramines, bad taste and odors found in tap water. NB: It’s not currently available in the UK (you might want to try the PearlCo glass jug instead). 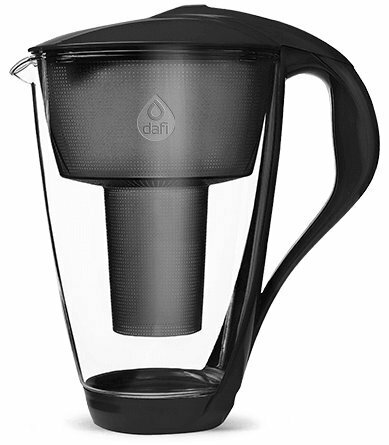 A more traditionally shaped filter pitcher, the Dafi Glass Alkaline Pitcher filters out some common contaminants and increases the pH of the water to make it more alkaline. It also increases the negative ORP potential of the water, to give it more antioxidant properties (antioxidants are thought to be de-toxifying). Alkaline water has received a lot of press over recent years, with some people hailing it as miracle health cure and others debunking it’s potential benefits as ‘nonsense’ (read a more balanced view here). Ancient health modalities such as Ayurveda, however, do talk a lot about the link between body acidity and ill health and the importance of maintaining a more alkaline state in the body. And whilst the science behind the potential benefits of alkaline water is complex, research certainly suggests that, if nothing else, drinking water with an increased pH has detoxifying properties. 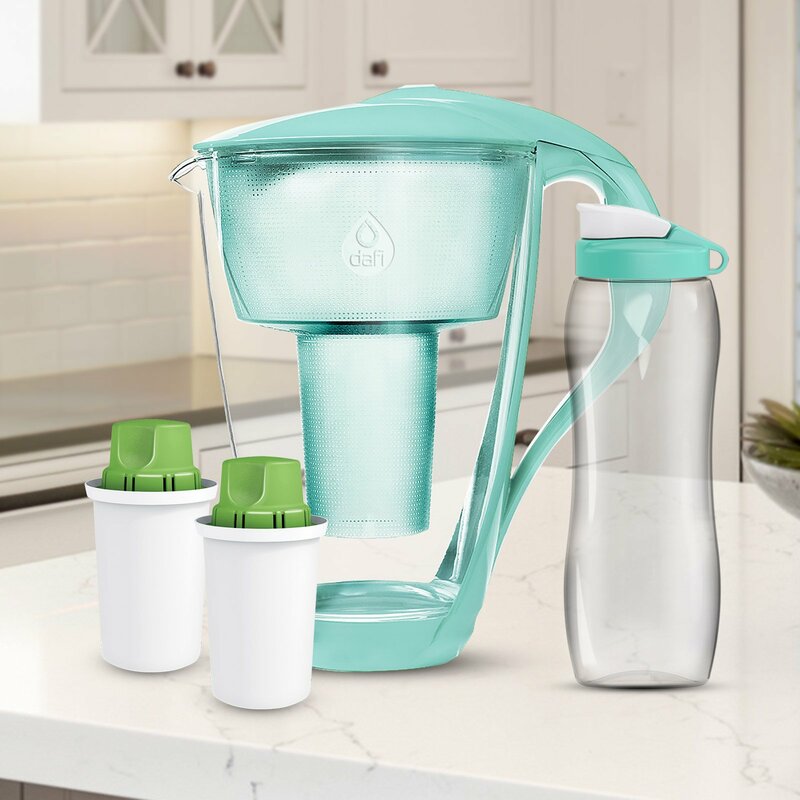 If you want to try alkaline water, the Dafi Alkaline Glass Filter is a good entry point into alkaline water that won’t hit your purse like a full blown ioniser or alkaline water machine will. The filter itself is made from sturdy borosilicate glass (handle and funnel are BPA free plastic) and holds a reasonable capacity of around 8 cups. What Does It Filter Out? NB: For UK residents, please note the Dafi filter is not listed as an ‘alkaline’ filter, but this one is. Another stylish option that’s designed in a carafe shape, the Soma Glass Carafe Filter is made from Borosilicate, shatter resistant glass and holds around 6 glasses (48oz) of freshly filtered water. The reservoir and lid of the Soma Carafe are both listed as BPA-free plastic. 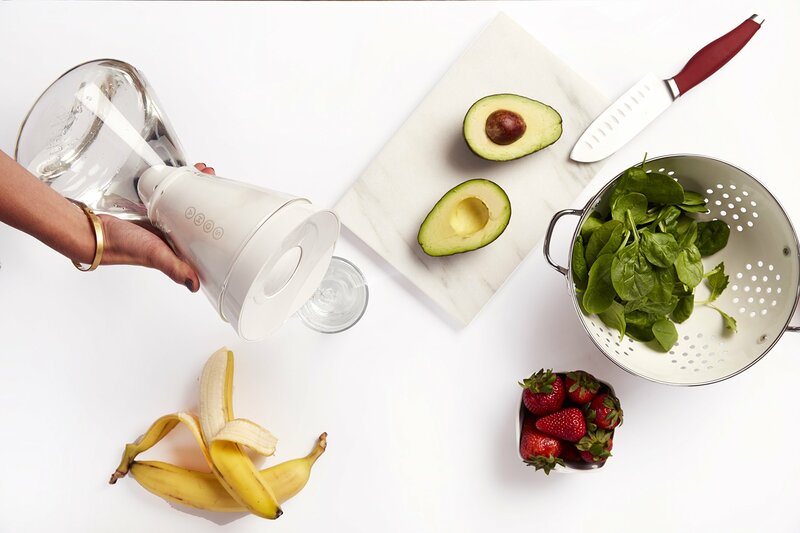 With an emphasis on sustainability, Soma also claim their filtration system is made from 65% renewable, plant-based materials. The filter itself is made of coconut shell carbon and whilst it’s not currently biodegradable, it can be composted at commercial facilities. For every Soma filter purchased, Soma also donate clean drinking water to those in need through their nonprofit, partner, charity. 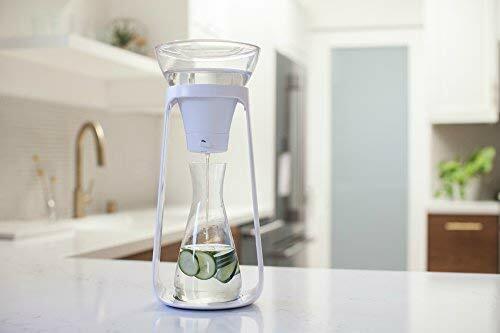 According to the Soma website, the Soma glass water filter carafe meets NSF Standard 53 and 42 requirements for the reduction of chlorine, taste and odour, zinc, copper, cadmium and mercury. It can get a bit frustrating when things are available in one country but not another (Soma & Kor Water Fall don’t seem readily available in the UK right now). So if you live in the UK and Europe, I’ve written a separate post on glass filter jugs available in the UK. For a quick recommendation, the Dafi glass water filter jug or the pH Replenish are both affordable options to consider that should be easy to get hold of. A glass water filter pitcher is a great way to largely avoid plastic, whilst filtering out some key contaminants often lurking in tap water. Almost all water filter pitchers, glass or otherwise, will tackle chlorine, odour and taste to some degree and many will reduce heavy metals such as lead. Always check product details to be clear on what the filter can do or look for NSF ratings. Keep in mind though, whilst water filter pitchers (glass or otherwise) are a great entry point for filtering out some common pollutants in tap water, they do have limitations. So if you want a pollutant busting superhero of a water filter, (that’s also mostly plastic free), or want to tackle fluoride, (notoriously hard to filter out), it’s hard to beat a stainless steel gravity water filter such as the Big Berkey, or British Berkefeld gravity filter (what we now use). Both filter out a huge range of contaminants and are compatible with dedicated fluoride filters if you want them (usually sold separately).